Although Mt. Washington just got a huge dump of snow, the mountain was closed to most people few weeks ago. It as the perfect time to go on a shoeshoeing trip. No skiiers or snowboarders! Only the people who didn’t mind taking off their winter footwear and hiking through the dirt and ice could enjoy the mountain. Carrying our snow shoes over packed snow. Out on the trails it was just us, a small group from the Victoria Outdoor Club, a large group of backpacking Boy Scouts and few families trying to build snow men. We kept going past where the Boy Scouts set up for the night until we found with some snow that hadn’t melted or been compacted by hikers. 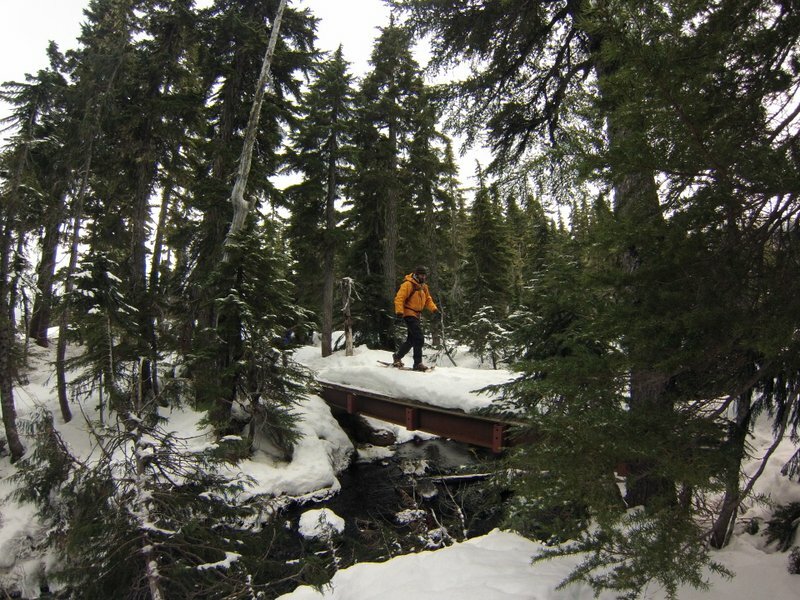 We then hopped off the main trail, put on our snow shoes for the first time, and went looking for a good camping spot. I was familiar with camping on snow thanks to my mountaineering course. But summer camping on a glacier does not really compare to winter camping, even in the very gentle climate of Vancouver Island. (It was about 3C in the day and -10C at night.) I had to be very careful about liquids freezing. After dark, my water bottle quickly froze solid when I set it down on the ground. This made me realize I had to keep my contacts and solution in my sleeping back with me, which is not something I had to do on Mt. Baker in the summer. Snow makes four-season tents happy. I put used my newly acquired mountaineering skills for staying warm. I ate a lot and often, especially loading up on sugar and fat before bed. (I recently read winter backpacking can burn 4,500-5,000 calories!) I also made sure to have hot drinks every chance I got, a NOLS favourite. This is really the reason I love alpine trips. It’s the perfect excuse for eating nearly unlimited CANDY! We were only out for one night, so we melted snow for water. This is too inefficient for longer trips, where you could not carry all that fuel. However, not having to hunt around for running water or building solar-powered garbage bag snow melting contraptions made things much easier. In the snowy hills somewhere. The next day, we hiked around off the beaten path due to our desire to actually use our snow shoes. No real destination in mind, just cruising around. I felt super stoked on having such a light backpack. I was only probably was carrying about 20 pounds total. Compared to the 45-50 pound beast I had to haul around the Cascades in September, I felt I was skipping. Very nice to use these, since we carried them all the way in. I listened to my own advice about investing in high quality gear, and bought my own very lightweight down sleeping bag. When I was a bit more of a novice backpacker, I also used to carry way too much stuff. Now I know no matter how many days I am going out for, I only have to bring one of each required item of clothing and very minimal toiletries. I can’t believe I used to pack around a change of clothes and deodorant. I also had a little fun with my GoPro. Ever wonder what things looks like below the water level? The stream bed and some cold plants. After hiking around in our snow shoes, we made our way out before it got dark around 5:00. We then drove back to Victoria in about three hours, with a stop for dinner in Nanaimo. A simple overnight weekend trip, but got to see a lot and have some fun in the snow. Hope you enjoyed the pics! Thanks, Jes for sharing your trip with us. Love all the beautiful pictures too.